Two city workers in Paterson have come forward with claims that some of their co-workers are billing the taxpayers for work they didn’t do. The claim comes after the I-Team last week broke a story showing city workers doing personal work at the mayor’s private residence. In one case, city records show that a worker was on the clock earning overtime at the same time he was seen on video carrying a beer cooler into Mayor Jose "Joey" Torres' house. 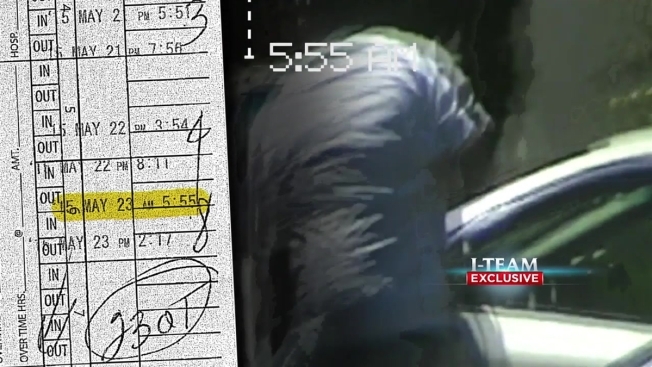 Now, two city employees – who asked that the I-Team protect their identities for fear that they will be retaliated against – are telling the I-Team that problems with timesheets are far-reaching. Each worker contacted the I-Team separately, unaware of the other. Both said a small group of workers close to the mayor is abusing the system. One described workers being paid for days at jobs they never showed up to do. The other said he and other workers are regularly asked to do work at private job sites on their city time. “Why pay when you have city workers who do the work for free?” one of the men asked. The second worker said for a few years now, he’s been aware that some workers who bill long hours never show up to the jobs they’re supposed to be doing. He said the no-show workers are part of a small clique of men close to Torres. After the I-Team's report was broadcast and published last week, Paterson city council members called for county and state prosecutors to investigate whether the mayor has used city workers improperly. The issues are expected to be debated publicly for the first time Tuesday night at the Paterson City Council meeting. In a Paterson Press newspaper report about the I-Team’s story, Torres told the newspaper that in one case, one or two city employees worked at his property to build four bookshelves in his daughter’s bedroom in the past year. He said the job was done on the employees’ own time, and he paid for the supplies and gave the employees $50 of his own money for the work. Several of the employees seen on the tapes spoke with the I-Team and said they did the work as personal favors for Torres on their own time. In a few cases, the city workers said Torres paid them out of his own pocket for the private jobs. But the workers who came forward after watching that I-Team report say a lot of tax dollars are going into the wrong pockets for the wrong reasons. “It hurts – because all you can do is just sit there... who you going to tell?" one of the workers who came forward said. "The guys who run it are the guys who are doing everything." Paterson city council members have already called for county and state prosecutors to investigate whether the mayor has used city workers improperly. The Paterson Press reports some city workers are being called to testify before a grand jury as part of the state attorney general's investigation. The videos were taken by private investigator Harry Melber, who was hired by a developer who was in a permit dispute with the city. For about a year on and off beginning in November 2014, Melber followed Torres and filmed the mayor both at the mayor’s home and the 15th Street strip mall.